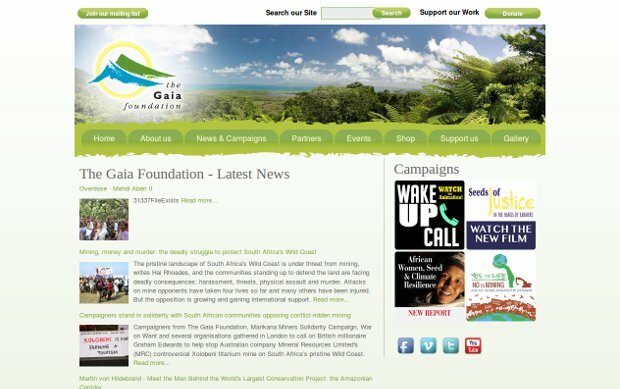 The Gaia Foundation is passionate about regenerating cultural and biological diversity, and restoring a respectful relationship with the Earth. Together with long-term partners in Africa, South America, Asia and Europe, they work with local communities to secure land, seed, food and water sovereignty. By reviving indigenous knowledge and protecting sacred natural sites, local self-governance is strengthened. This enables communities to become more resilient to climate change and the industrial processes which have caused the many crises we now face. Gaia makes a long-term commitment with their partners to address the root causes of today’s most pressing ecological, social and economic injustices. They are a small, flexible team, which enables them to read and respond quickly to emerging issues and opportunities for change. Their work is founded on the recognition that the Earth is a dynamic living whole whose complex processes have maintained the conditions for life to evolve over millions of years. Humans are an integral part of these living processes and we depend on them for our own wellbeing. It is for this reason that we must ensure that we find a mutually enhancing way to live on the planet, the only home for all species, including ourselves.